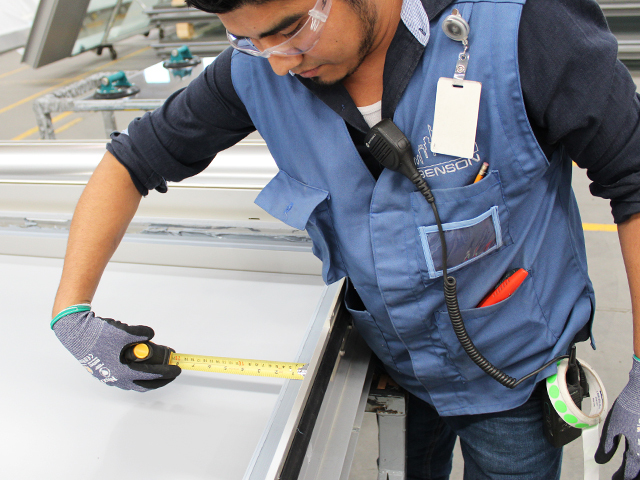 From extrusion fabrication, to coordinating the right supplier to the project, to testing and assembly, and quality control, curtain wall production begins with engineering. 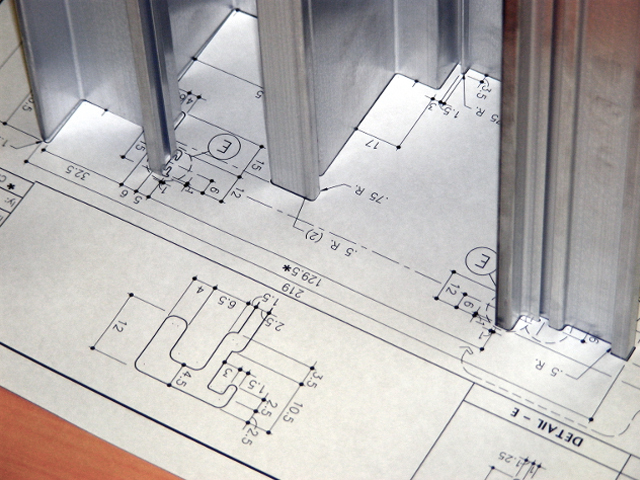 From extrusion fabrication, to coordinating the right supplier to the project, to testing and assembly, and quality control, production begins with engineering. Benson’s vertical integration process gives the engineering, manufacturing and installation teams the ability to create system designs that synchronize aesthetics, performance, and efficiencies throughout fabrication, manufacturing, and installation. Benson’s fabrication group works in concert with the shop drawing team to assure all current design elements are coordinated. Curtain wall designs are modeled and fabrication drawings are produced with explicit attention to detail and double-checked by experienced fabrication leaders to assure that every extrusion, clip, panel, anchor, etc. is produced accurately. To facilitate smooth and error free production, new extrusion dies are manufactured and test run aluminum shapes are extruded and fabricated prior to the Performance Mock-up. The team then meets with the extruder to assemble the units without sealant glass or gaskets. The “dry fit” provides an opportunity for engineering, extrusion, fabrication and manufacturing personnel to review key aspects of the system design. Adjustments or enhancements borne out from this hands-on step are incorporated into the final design and fabrication direction to ensure the highest level of workmanship is achieved through the project. Benson’s commitment to quality and excellence extends through to our supply chain. By identifying suppliers that have similar quality principals and building long-term relationships with those companies and their people, Benson is able to create a worldwide supply chain network. Benson understands the parameters of each manufacturer’s core competency and inherent strengths and weaknesses using the knowledge to best match a supplier’s abilities with the demands of the project so every partner can contribute to the success of each phase of the process. 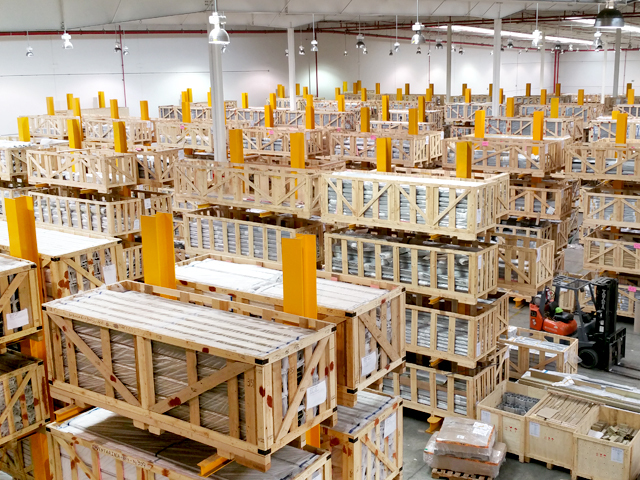 All components of Benson’s system come together in the flagship assembly facility in Otay Mesa, Mexico. With 300,000 SF under roof, another 115,000 SF of outside yard and over 600 dedicated workers, Benson has the capacity to manufacture as many as six unique systems at one time. The versatile plant floor layout allows Benson to easily re-configure workflow to accommodate schedule, dimensions, and materials as needed for the façade. Custom inventory and in-progress production flow software provides real time data on production rates, inventory, and other key data points – important information for supply chain order control and project management scheduling. Quality control begins with the close relationships Benson fosters with key suppliers in the supply chain. 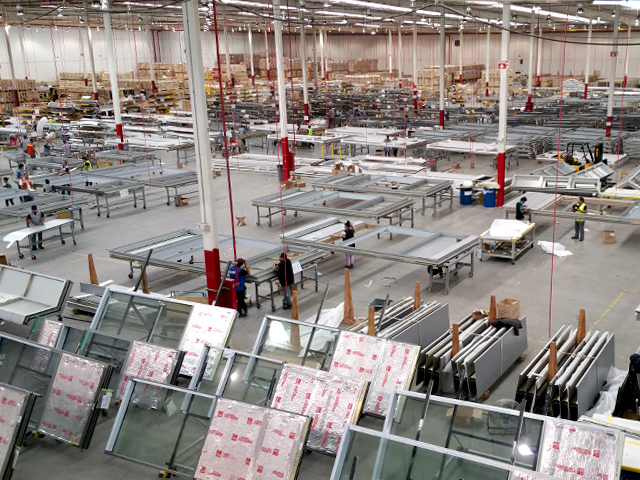 Whether aluminum extrusions, glass, silicone, gaskets, aluminum or stainless panels, it is paramount to the Benson process that the materials are received and fabricated correctly, shipped and transported securely and safely. Benson delves into our suppliers ability and core competence, with clear communication to set achievable goals and expectations. Benson’s quality control procedures have been highly successful in catching errors earlier in the process, reducing in-plant rejection rates. The Benson process of collaboration chain knowledge helps the company to establish and honor schedule and quality commitments to its customers. Keeping water out and allowing thermal control of the interior space are of extreme importance. A failure of the building envelope can result in a number of unwelcome issues such as: moisture infiltration, mold and mildew, wind damage, high energy costs, maintenance problems, failure of building systems, loss of architectural aesthetic intent, and safety concerns. That is why a thorough quality control process is used in order to ensure all projects are carried through effectively and efficiently. 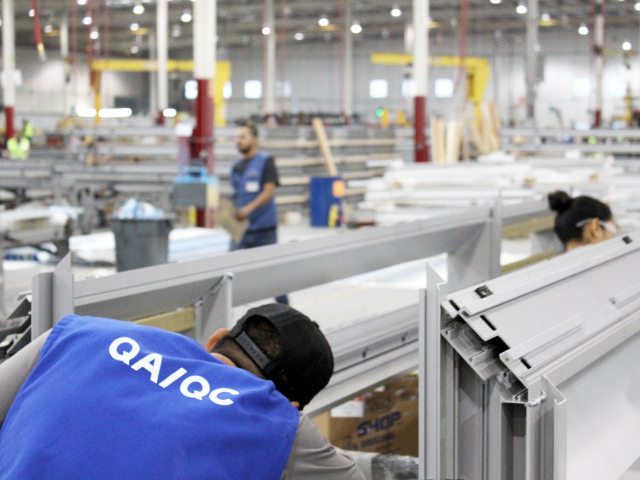 In plant, quality control includes programs and testing to assure silicone adhesion, strength and viscosity, dimensional checking of extrusions and glass, paint thickness, color matching, and finished curtain wall unit air and water integrity. Benson protects each completed curtain wall unit with a protective coating that creates a durable and peel-able skin to finishes and materials susceptible to scratching or damage during transport, installation, or in place by following trades. The protected units are then crated and shrink-wrapped prior to making their journey to the jobsite. For certain projects, Benson also can load and transport units on steel racks – eliminating the need to dispose of crating materials on site.